The roofs of new commercial buildings in France must henceforth be partially covered in plants or solar panels, under a law just approved by the French Parliament. Although scaled down from a more sweeping proposal, the law approved Thursday (March 20) "is trailblazing," reports Climate Progress, an environmental news site. 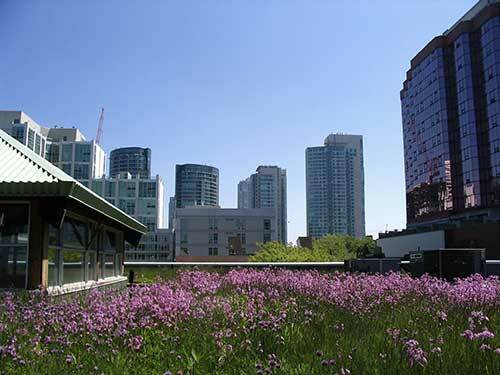 Toronto, Canada, has mandated green roofs for industrial and residential buildings since 2009. The roof of the Mountain Equipment Co-op store in Toronto was abloom even before that. The law "will both change the urban landscape of cities across France as well as potentially inspire other countries to follow suit," the site says, noting that the 2015 U.N. Climate Change Conference will be held in December in Paris. The original French proposal, pushed by environmental activists, would have mandated total rooftop coverage with greenery on all new buildings. The new law requires only partial coverage and gives businesses a choice of planting their roofs or installing solar panels. 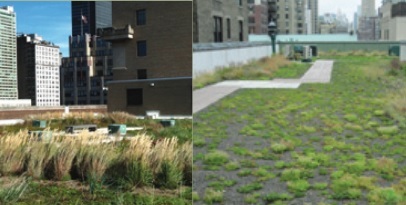 NASA is among the scientific organizations that have documented the benefits of green roofs (bottom) like those atop the U.S. Postal Service (top left) and Regis High School (top right), both in Manhattan. The Postal Service roof covers 68,000 square feet. 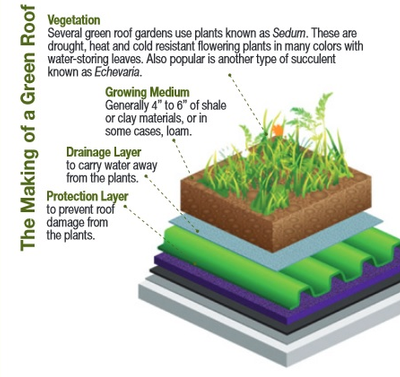 Green roofs were first used in Scandinavia, according to NASA, which is among the major scientific organizations that have published research on the benefits of green roofs. In 1997, Munich, Germany, approved an ordinance that mandated vegetation on all flat roofs larger than 100 square meters. In 2009, Toronto, Canada, mandated green roofs for industrial and residential buildings, and the roofs are popular across Germany and Australia, the UK's The Guardian reports. Vegetative roofs act as insulators, reducing heating needs in winter, cooling needs in summer, capturing rainwater and providing nesting space in urban areas, scientists say. Scientists say vegetative roofs can significantly reduce the "heat island" effect in large cities while providing a foundation for biodiversity. 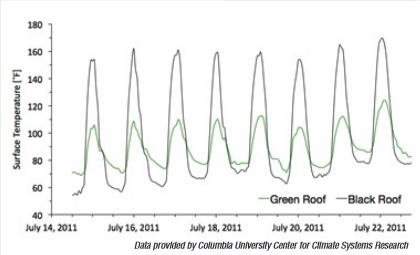 In a study by Michigan State University, researchers found that replacing traditional roofing materials with green roofs in an urban area about the size of Detroit, with one million peple, "would capture more than 55,000 tons of carbon"—the rough equivalent of "eliminating a year’s worth of carbon dioxide emitted by 10,000 mid-sized SUVs and trucks," according to livescience.com. In general, France has lagged much of Europe's steady adoption of solar power, reports IEEE, the Institute of Electrical and Electronics Engineers. In 2012, the group said, nuclear power provided more than 80 percent of France's energy needs.